In Houston, where flood damage took out the two most important criminal justice facilities, some defense attorneys are worried that trial delays are robbing their clients of justice. It’s been 10 weeks since Jose Deras was first locked up in the Harris County Jail. And because of Hurricane Harvey, it’s nearly impossible to predict how much longer he might be there. Deras — who is locked up for a misdemeanor assault charge, the first black mark on his otherwise clear criminal record — faces up to a year in jail, meaning that even if he got the maximum sentence, his actual time served would likely total about four months. But Deras' lawyer thinks his client will most likely spend more time than that in his cell, waiting for his case to come before a jury. Since Harvey hit Harris County in late August, one of the busiest criminal court systems in the country has suspended all jury trials. It’s just one of a slate of challenges facing the county’s justice system in the weeks since the storm, but defense attorneys argue that delayed trials — and in dozens of cases, prolonged detention — have the potential to infringe on their clients’ most fundamental rights. Justice delayed, they argue, has begun to verge on justice denied. The U.S. Constitution guarantees the right to a “speedy" trial, but the law offers no specific guidance on what “speedy” means. And it's not entirely clear how that right might change in the face of unprecedented natural disaster. Jury trials could resume in Harris County as soon as Oct. 16, when jurors will be summoned again to a host of makeshift assembly rooms downtown. But at least at first, the county will not be able to assemble nearly the usual number of jurors, and courthouse workers will have to ration those jurors across 22 felony and 16 misdemeanor courts. Judge Margaret Stewart Harris, who is presiding over Deras’ case, said she hopes to hear it as soon as juries are assembled again. But Franklin Bynum, Deras’ attorney, said he doubts his client will be in court that soon. 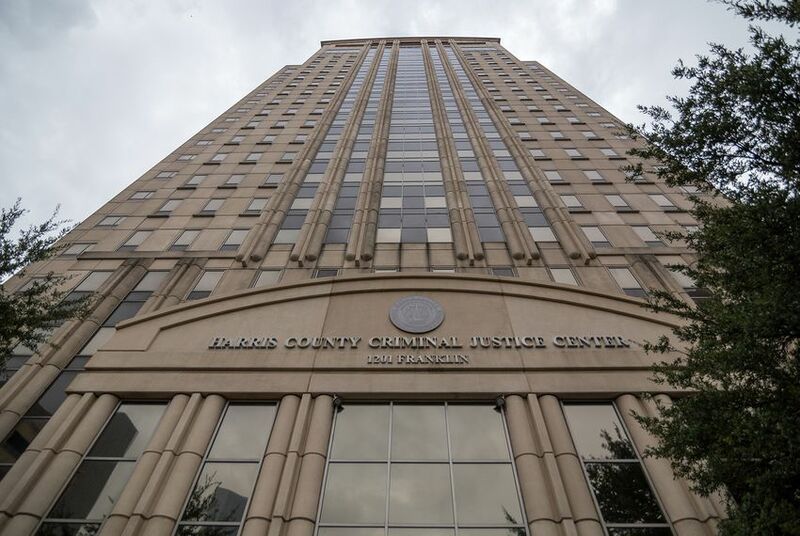 The $95 million Harris County Criminal Justice Center was only months old in 2001 when Hurricane Allison hit, taking with it the glow of the new brick veneer and swamping much of the equipment housed in the basement. The building was repaired and new flood protections installed. 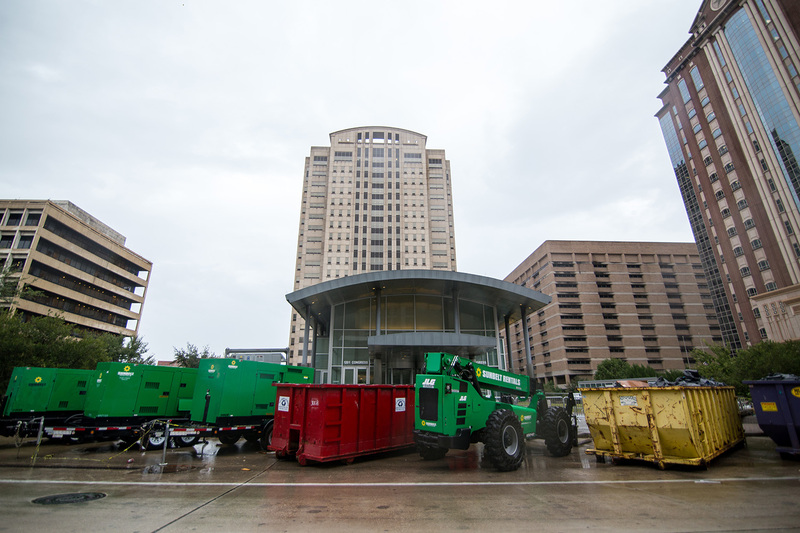 Those were compromised this summer during Harvey, when much of the 581,000-square foot building was inundated once again with several feet of water, and damage reached at least to the 16th floor. Pipes ruptured and windows shattered. Sewage oozed out of first-floor bathrooms. Staffers escaped the building using ropes. This time, the damage has left a 20-story hole in the county’s justice system, taking out 40 courtrooms, the district attorney’s office and enough holding cells to accommodate 900 inmates. Partial occupancy may be possible in six to eight months, but county engineers say it will likely a take a year and a half — and $30 million — for the building to return to full capacity. The bigger problem, according to local officials, sits a block southwest of the courthouse. 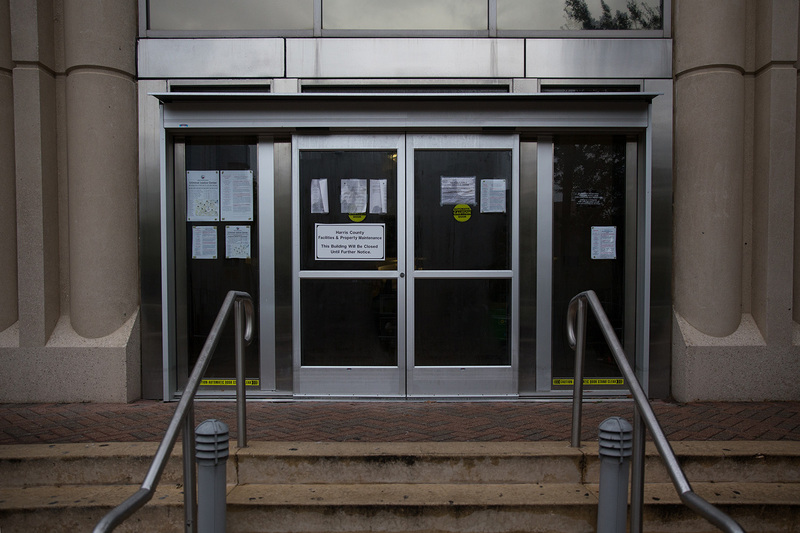 The three-floor jury assembly building at 1201 Congress Ave. saw just as much damage, but the bulk of its business takes place below ground, where on the county’s busiest days, about 800 potential jurors can be assembled. The subterranean floor was so damaged that it may not even be repaired. That means there’s nowhere to assemble the jurors that the county needs to take cases like Deras’ to trial. As a result, hundreds of trials have been delayed, and about 100 defendants sit in custody awaiting their turn. In the weeks since the storm, court locations have been shuffled around, civil trials have been delayed at least until Nov. 1 and judges based out of the Criminal Justice Center have moved into nearby court facilities. Most of those courtrooms now handle a double caseload. Only a fraction of those courtrooms are equipped with holding cells for inmates, meaning more bottlenecks in scheduling jury trials and higher costs to the sheriff’s office, which must ensure that inmates are secured when they go to court. Lawyers, judges and administrators describe a confusing schedule of appointments across a network of makeshift spaces. Judges shuffle between their jail docket courtrooms, their bond docket courtrooms and their trial courtrooms; lawyers struggle to keep up. Meanwhile, prosecutors have to lug hundreds of court files to nine different locations across downtown Houston. Nathan Beedle, the misdemeanor division chief for the Harris County District Attorney’s office, said his staff is working out of the 16th floor of the Cotton Exchange Building, five blocks from the Criminal Justice Center. “I’m in a ballroom with 88 people in one room, and I have about 26 inches for a desk. And I’m the division chief,” Beedle said. The court system has resumed business in stages since Harvey. Judges were in jail holding makeshift jail dockets as soon as Aug. 29, as rains were still soaking the city. Other court proceedings resumed Sept. 11, with judges working elbow-to-elbow in makeshift quarters. Jury trials will be the last part of the justice system to come back online. Starting later this month, jurors will be summoned to the cafeteria and other large rooms in the Harris County Administration Building. It's a quick-and-dirty solution; administrators have had to order portable bathroom facilities and rent folding chairs. Even with these measures, though, the county will not be able to accommodate the usual 800 potential jurors. They’ll start with about a third of that number — meaning jury trials will resume at a staggered pace. Meanwhile, dozens remain in jail waiting for their day in front of those jurors. Some of those defendants face charges as severe as capital murder or aggravated sexual assault; for them, a delay of a few months could be negligible or even helpful, if a defense attorney needs more time for evidence collection, for example. But for people like Deras who have been charged with low-level offenses and whose sentences would last only a few months, those delays are critical. Judges and county administrators insist they are doing the best they can under the circumstances and say defendants in custody will take precedence once trials resume. And the district attorney’s office has worked to get as many people out of custody as possible, Beedle said. That means dismissing minor cases, reaching more plea agreements and recommending trials in front of a judge rather than a jury. But that hasn't helped Deras, who has resisted taking a plea bargain because he's undocumented and knows that a criminal conviction makes deportation more likely. He'll stay in jail awaiting trial while his attorney fumes. Can flooded-out Houstonians win lawsuits against Army Corps?